A look back at Royal Doulton’s iconic Top o’ the hill! Without doubt Top o’ the hill remains Doulton’s most instantly recognisable figure. Since her introduction in 1937, Leslie Harradine’s ever popular figure has been used as a demonstration piece at exhibitions and it was great to see this tradition continue at the recent ICGF in Florida. 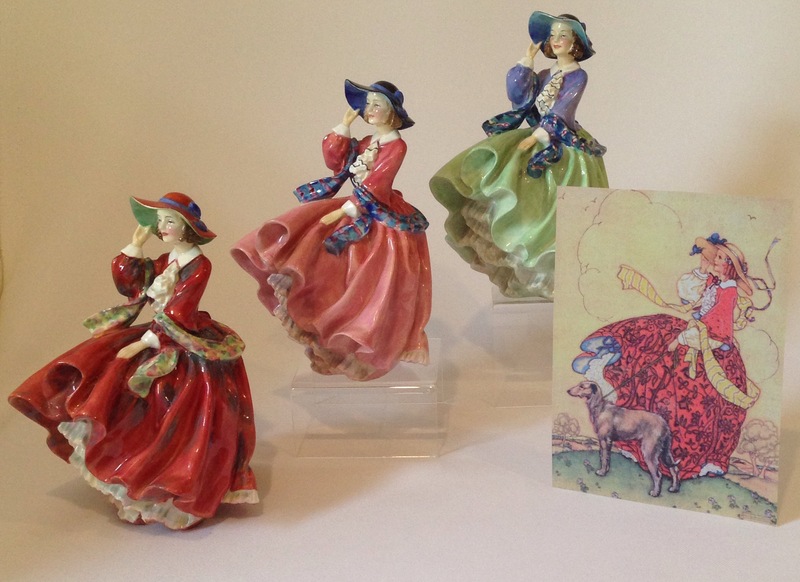 Doulton’s figure was based on a picture by Molly Benatar (illustrated) whose rights for reproduction in china were bought exclusively by Doulton. Not a bad investment on Doulton’s part given her lengthy production. Interestingly, from a collector’s point of view are the subtle changes to her over the years. The figures illustrated all date to 1937 and 1938 and are the original 3 colourways. Changes to her have included a deeper base, less detailed, delicate frills to her underskirt and a thicker brim to her hat – all of which were invariably made in response to collectors’ feedback as these early versions are all very fragile. Another interesting note is the difference that occured in painting during the war years to the red version. HN1834 originally had blue streaks as many red figures from this time did, but after Doulton began producing figures again after the war, she became a solid red. Another change occurred in the 1950’s when she was modelled with an elongated face, no doubt a change to then fashions. This change was later reversed and I doubt people even realised there had been a change! In more recent times there have been other colourways of this iconic figure introduced, including a yellow and green one HN2127 for Australia’s Bicentenary in 1988 and a deep blue one HN3735 in 1997. A miniature was also made in a few colourways including the popular red in the late 1980’s and early 1990’s. Most recently a petite size has also been introduced. Previous PostAnother glimpse of a certain project…Next PostIt is almost here – Doulton Collectors Club Magazine!